Diego Simeone’s love affair with Atletico Madrid is set to continue for another three years after the Argentine renewed his contract until 2020 last week. Since taking charge in 2011, Simeone, 47, has transformed the club’s fortunes, turning Atletico from perennial underachievers to serial contenders both domestically and in the Champions League. However, having lost in agonizing fashion twice to local rivals Real Madrid in two Champions League finals, Simeone has turned his back on lucrative offers elsewhere for the challenge of making Atletico champions of Europe for the first time. Simeone has already delivered five trophies, the highlight of which was ending Real and Barcelona’s hegemony of Spanish football with a first La Liga title for 18 years in 2013/14. Yet, the Champions League has continued to elude Los Rojiblancos with Real their conquerors in all four seasons since Simeone led them back into European football’s premier competition. Atletico were seconds away in the 2014 final before Sergio Ramos’ injury-time header forced extra-time and Real ran out 4-1 winners. Simeone was tempted to walk away last summer. Having initially agreed a contract to 2020 back in 2015, he asked for the deal to be cut by two years till 2018. That appeared to open the door for an exit with another of his former clubs Inter Milan, freshly flushed with cash thanks to a Chinese takeover, among those interested. 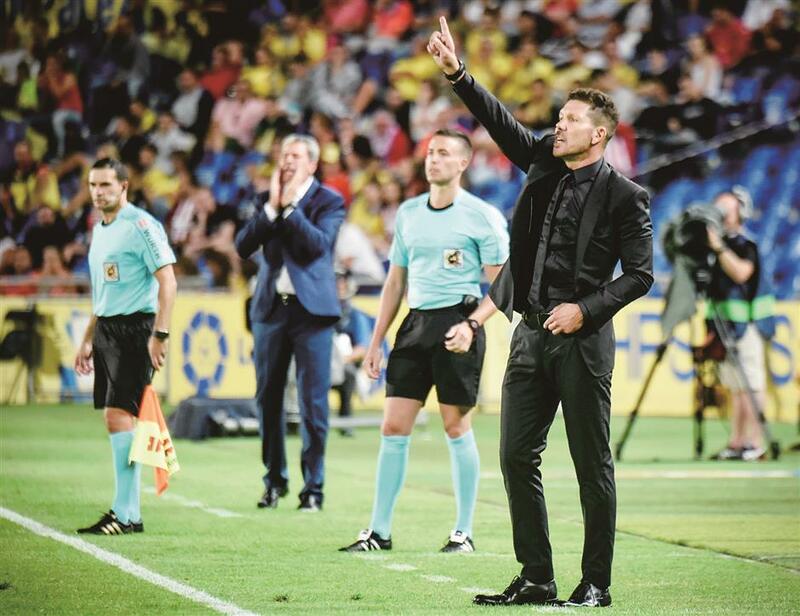 Atletico Madrid’s Argentinian coach, Diego Simeone, celebrates after his team scored their first goal during the Spanish league match against UD Las Palmas at the Gran Canaria stadium in Las Palmas on August 25. Yet, Simeone now seems set to add stability to a new era for Atletico. Although still unable to match the financial muscle of Real and Barca, continued success on the field and the stadium move have allowed Atletico to stop having to sell their best players. Antoine Griezmann, Koke and Saul Niguez have all themselves recently signed new contracts. Despite a ban on registering new players in the recently closed transfer window, Atletico have already completed a deal for Spanish international Vitolo to arrive in January. Meanwhile, Spanish media have reported Diego Costa’s return to the club from Chelsea was one of Simeone’s demands to stay on. Costa, who was Atletico’s top scorer when they won the title in 2013/14, hasn’t played for the English champions this season due to a fallout with manager Antonio Conte and was left out of the Chelsea’s Champions League squad last week. That is doubly good news for Atletico as they face Chelsea in a tough Champions League group. Costa would also then be free to play for Atletico in Europe should they make it to the last 16. His extra firepower could be the final missing piece for Atletico and Simeone to end their long wait to lift the Champions League come May in Kiev.